A fundraiser is planned next month to benefit the family of Paul Roop, a member of the fire department since 1996. FLINT TWP. — The Firefighter Paul Roop Benefit Spaghetti Benefit Dinner is being planned for 1-4 p.m. Saturday, January 21 at the VFW Hall-, G-4138 Corunna Road. 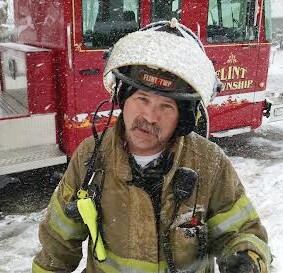 Roop, a 20-year member of the Flint Township Fire Department, was diagnosed with Stage Four cancer in October and is currently undergoing chemotherapy according to a flyer posted on the Carman-Ainsworth Schools Facebook Page. The benefit is being planned to support the Roop family “as they go through this challenging time in their lives,” according to organizers. Admission is $8 at the door for adults and free for children age 5 and under. A raffle, bake sale and door prizes will be part of the event. Roop has always been a person who leads by example in the community, Burkley said. Roop’s son Brian, is also a member of the fire department, following in his father’s footsteps, he said. For more information about the benefit dinner, contact Rob or Debbie Jarnigin at 810-732-5338.